To access General Settings, log into Back Office. 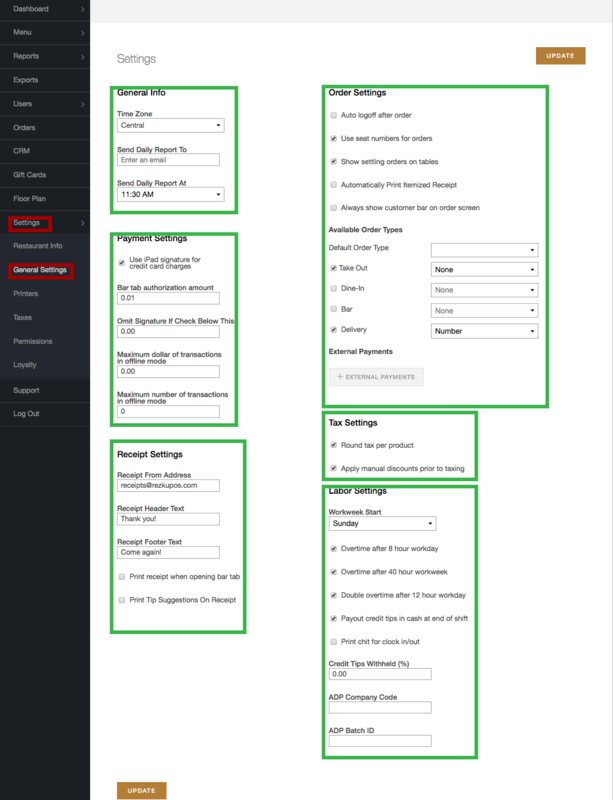 ● In the left-side navigation column click Settings, then General Settings. Time Zone — Make sure this is set to your correct time zone or reporting will be off. Send Daily Report To — Enter an email address to send the daily report. 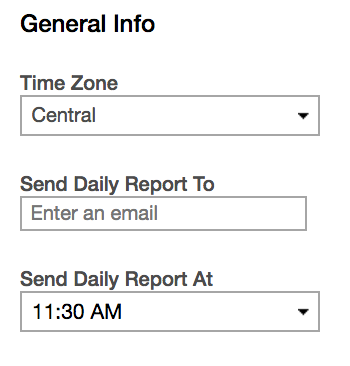 Send Daily Report At — Specify a time for the daily report to be sent. Use iPad signature for credit card charges — This is used for paperless CC authorization. Uses Sign-On-Screen to authorize credit card transactions. Bar tab authorization amount — When swiping a card to open a tab, this sets the pre-authorization amount. 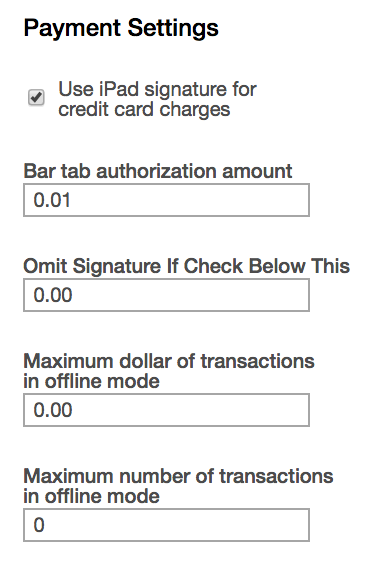 Maximum Dollar of Transactions in Offline Mode — Set a daily dollar limit for offline transactions. Daily limit does not reset when internet connection resumes. Maximum Number of Transactions in Offline Mode — Set a numerical daily limit for offline transactions. Daily limit does not reset when internet connection resumes. Receipt from address - When guests choose emailed receipts this will show who the email is from. 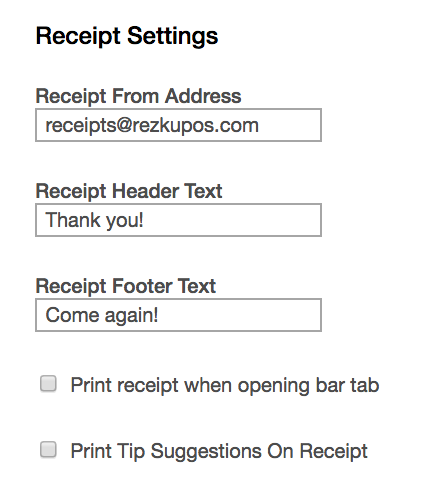 Receipt header text - When itemized receipts print, this is the text at the top. Print receipt when opening bar tab - Prints a record of the tab stating the guest agrees to a 20% tip if they leave before settling. Print tip suggestions on receipt - This prints on the merchant copy the customer signs showing tip amounts for 10%, 15% and 20%. Auto logoff after order — This is enabled by default. After each order, the register will display a lock screen. Employees must put in their PIN number to unlock the tablet. 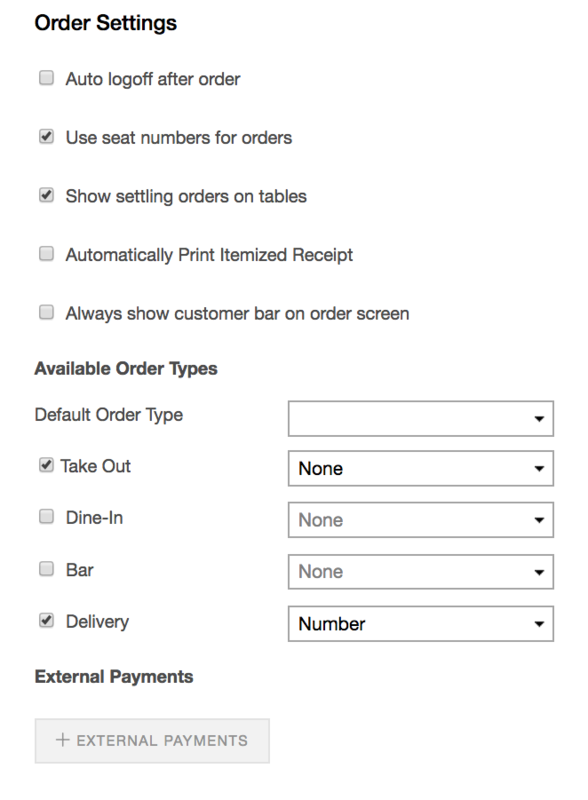 Use seat numbers for orders — Enables seat numbers when performing table service. Items can be assigned per seat or shared. Show settling orders on tables — As a reminder to server to close tickets Awaiting Patron Signature. Automatically print itemized receipt — When this is selected an itemized receipt will print automatically when the Checkout button is tapped. 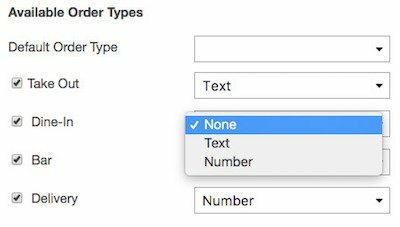 Default Order Type - Specify a default order type using the drop down menu. This order type will be chosen for new orders unless a different order type is selected. Selecting None does not choose a default order type. With None selected, order type must be selected to check out. 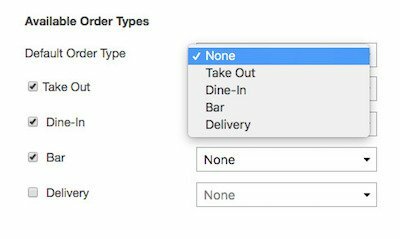 ● Check the boxes next to Order Types to include for your restaurant. 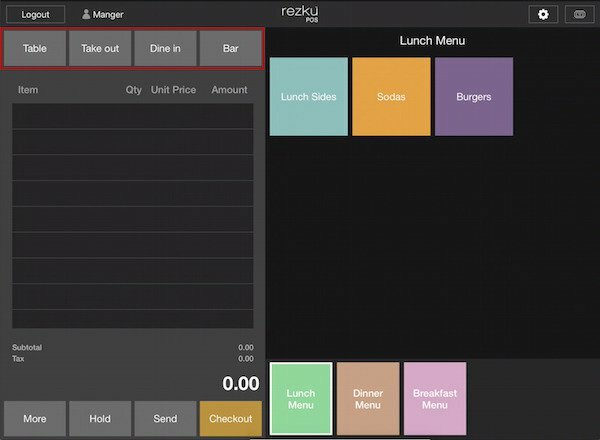 The check-marked order types appear at the top of the New Order screen in Rezku POS. Next to each Order Type is a drop down box to choose if you want a number or text (such as guest’s name) attached to the order. When a new order is started in Rezku POS, the selected information is required. NOTE: Every transaction in Rezku POS is assigned a unique order ID regardless of this setting. Enabling this feature lets you take additional payment types from services such as GrubHub.com or gift certificates. Round tax per product - When selected, taxes are calculated by item price. When unchecked taxes are calculated by order total. Workweek Start - choose the first day of the week in your labor system. Overtime after 8 hour workday - When selected, employees earn overtime pay after 8 hours on shift. Overtime after 40 hour workweek - When selected, employees earn overtime pay after working 40 hours from the workweek start day. Double overtime after 12 hour workday - When selected, employees earn double overtime pay after working 12 hours in the same day. 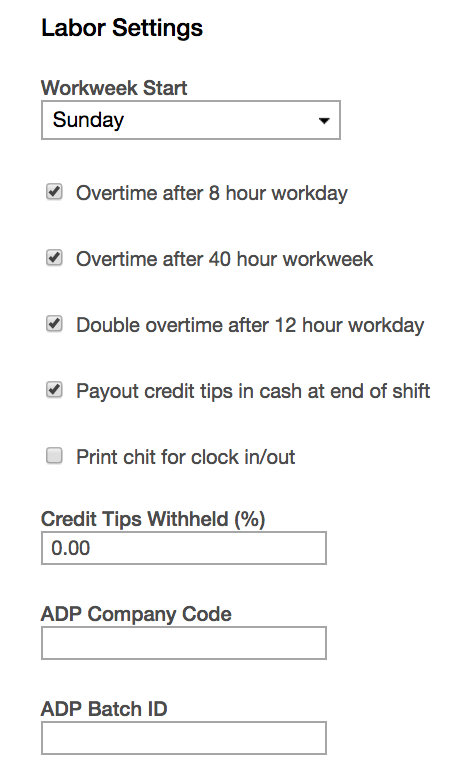 Payout credit tips in cash at end of shift - Check this box to pay out credit tips as cash. A window will pop up when the server taps End Shift when clocking out, allowing the server to cash out credit tips. Print chit for clock in / out - Prints a record of a punch from the receipt printer. Gives the employees a paper trail for their punches. Credit Tips Withheld - Set a percentage of money withheld from credit card tips when servers are cashing out their tips. ADP Company Code - Used with ADP payroll integration. Contact ADP or review your ADP documentation to get this number. ADP Batch ID - Used with ADP payroll integration. Contact ADP or review your ADP documentation to get this number. To save changes made in General Settings, make sure to click the gold Update button at the bottom of this page. 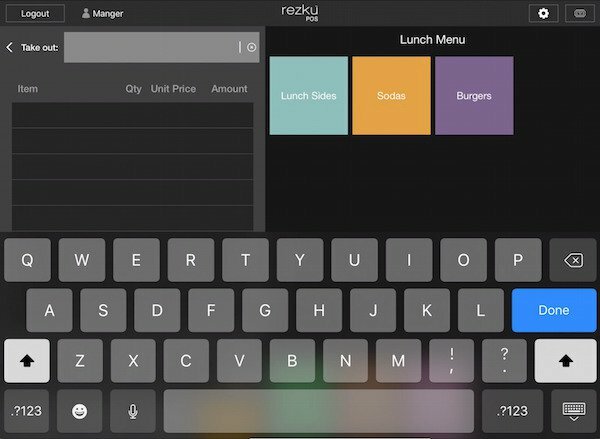 To see changes made quickly show up in Rezku POS go to Settings (Gear icon on the top right) on the tablet and tap the Refresh Settings button.